When it comes to dealing with the cosmos, we humans like to couch things in familiar terms. When examining exoplanets, we classify them based on their similarities to the planets in our own Solar System – i.e. terrestrial, gas giant, Earth-size, Jupiter-sized, Neptune-sized, etc. And when measuring astronomical distances, we do much the same. For instance, one of the most commonly used means of measuring distances across space is known as an Astronomical Unit (AU). Based on the distance between the Earth and the Sun, this unit allows astronomers to characterize the vast distances between the Solar planets and the Sun, and between extra-solar planets and their stars. According to the current astronomical convention, a single Astronomical Unit is equivalent to 149,597,870.7 kilometers (or 92,955,807 miles). However, this is the average distance between the Earth and the Sun, as that distance is subject to variation during Earth’s orbital period. In other words, the distance between the Earth and the Sun varies in the course of a single year. 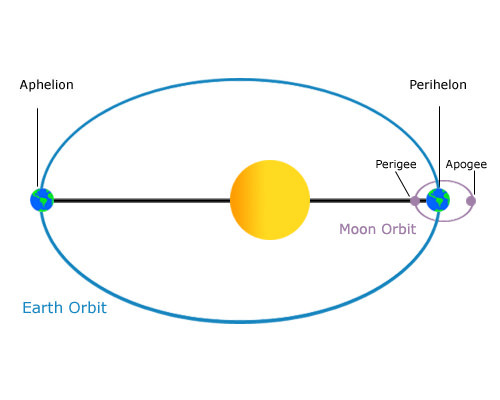 During the course of a year, the Earth goes from distance of 147,095,000 km (91,401,000 mi) from the Sun at perihelion (its closest point) to 152,100,000 km (94,500,000 mi) at aphelion (its farthest point) – or from a distance of 0.983 AUs to 1.016 AUs. The earliest recorded example of astronomers estimating the distance between the Earth and the Sun dates back to Classical Antiquity. In the 3rd century BCE work, On the Sizes and Distances of the Sun and Moon – which is attributed to Greek mathematician Aristarchus of Samos – the distance was estimated to be between 18 and 20 times the distance between the Earth and the Moon. However, his contemporary Archimedes, in his 3rd century BCE work Sandreckoner, also claimed that Aristarchus of Samos placed the distance of 10,000 times the Earth’s radius. Depending on the values for either set of estimates, Aristarchus was off by a factor of about 2 (in the case of Earth’s radius) to 20 (the distance between the Earth and the Moon). The oldest Chinese mathematical text – the 1st century BCE treatise known as Zhoubi Suanjing – also contains an estimate of the distance between the Earth and Sun. According to the anonymous treatise, the distance could be calculated by conducting geometric measurements of the length of noontime shadows created by objects spaced at specific distances. However, the calculations were based on the idea that the Earth was flat. Famed 2nd century CE mathematician and astronomer Ptolemy relied on trigonometric calculations to come up with a distance estimate that was equivalent to 1210 times the radius of the Earth. Using records of lunar eclipses, he estimated the Moon’s apparent diameter, as well as the apparent diameter of the shadow cone of Earth traversed by the Moon during a lunar eclipse. Using the Moon’s parallax, he also calculated the apparent sizes of the Sun and the Moon and concluded that the diameter of the Sun was equal to the diameter of the Moon when the latter was at it’s greatest distance from Earth. From this, Ptolemy arrived at a ratio of solar to lunar distance of approximately 19 to 1, the same figure derived by Aristarchus. 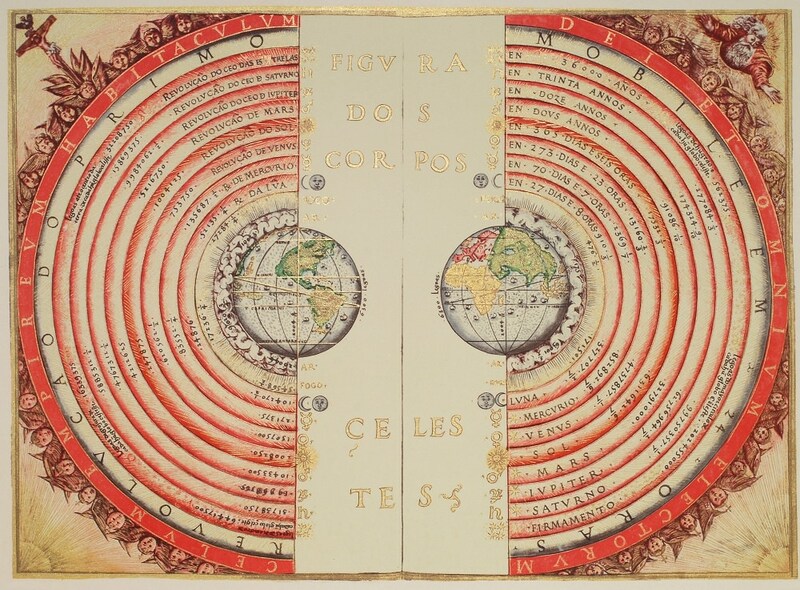 For the next thousand years, Ptolemy’s estimates of the Earth-Sun distance (much like most of his astronomical teachings) would remain canon among Medieval European and Islamic astronomers. It was not until the 17th century that astronomers began to reconsider and revise his calculations. This was made possible thanks to the invention of the telescope, as well as Kepler’s Three Laws of Planetary Motion, which helped astronomers calculate the relative distances between the planets and the Sun with greater accuracy. By measuring the distance between Earth and the other Solar planets, astronomers were able to conduct parallax measurements to obtain more accurate values. By the 19th century, determinations of about the speed of light and the constant of the aberration of light resulted in the first direct measurement of the Earth-Sun distance in kilometers. By 1903, the term “astronomical unit” came to be used for the first time. And throughout the 20th century, measurements became increasingly precise and sophisticated, thanks in part to accurate observations of the effects of Einstein’s Theory of Relativity. In response to the development of hyper-precise measurements, the International Committee for Weights and Measures (CIPM) decided to modify the the International System of Units (SI) in 1983. Consistent with this, they redefined the meter to be measured in terms of the speed of light in vacuum. However, by 2012, the IAU determined that the equalization of relativity made the measurement of AUs too complex, and redefined the astronomical unit in terms of meters. In accordance with this, a single AU is equal to 149597870.7 km exactly (92.955807 million miles), 499 light-seconds, 4.8481368×10-6 of a parsec, or 15.812507×10-6 of a light-year. Today, the AU is used commonly to measure distances and create numerical models for the Solar System. It is also used when measuring extra-solar systems, calculating the extent of protoplanetary clouds or the distance between extra-solar planets and their parent star. When measuring interstellar distances, AUs are too small to offer convenient measurements. As such, other units – such as the parsec and the light year – are relied upon. The Universe is a huge place, and measuring even our small corner of it producing some staggering results. But as always, we prefer to express them in ways that are as relatable and familiar. We’ve written many interesting articles about distances in the Solar System here at Universe Today. Here’s How Far are the Planets from the Sun?, How Far is Mercury from the Sun?, How Far is Venus from the Sun?, How Far is Earth from the Sun?, How Far is Mars from the Sun?, How Far is Jupiter from the Sun?, How Far is Saturn from the Sun?, How Far is Uranus from the Sun?, How Far is Neptune from the Sun?, How Far is Pluto from the Sun? If you’d like more information about the Earth’s orbit, check out NASA’s Solar System Exploration page. We’ve also recorded an episode of Astronomy Cast dedicated to the measurement of distances in astronomy. Listen here, Episode 10: Measuring Distance in the Universe. EarthSky – What is an astronomical unit? Very interesting and amazing how 2000+ years ago people actually thought about this… considering the very limited tools available at the time! Next PostNext What is the Color of Pluto?